I love the fall. Sure, I miss being able to wear flip flops, but I love the slight chill in the air, the colorful leaves on the trees, the scarves and sweaters that I can wear. I also love the assortment of produce available in the fall. As much as I love summer squash, I love winter squashes even more. Included in this family is spaghetti squash. Spaghetti squash is newer to my cooking repertoire. However, it has come to play an important role in my fall and winter cooking. What I like most about it is that I can use it in place of regular pasta and have a hearty dish that isn’t heavy. Load your pasta bowl with spaghetti squash, and you feel full. However, you don’t feel like you need to take a nap as a bowl of rigatoni would do. The other thing that I like about spaghetti squash is that it plays well with other ingredients. I have served it with dried cranberries, which gives a nice sweet contrast to the squash. I also have served it simply with marinara. Last week I decided to try topping it with an assortment of vegetables that were hanging out in the produce bin. Again, my darling spaghetti squash mingled nicely with its fellow ingredients. I based this recipe on what was available in my refrigerator. I am certain that other combinations of veggies could work well. However, make sure that they are bright and colorful vegetables. Not only will they make the plates attractive, the brighter veggies typically have more nutritional value. So, not only will it look and taste good, but it also will be good for you! The recipe for roasted beets can be found here. 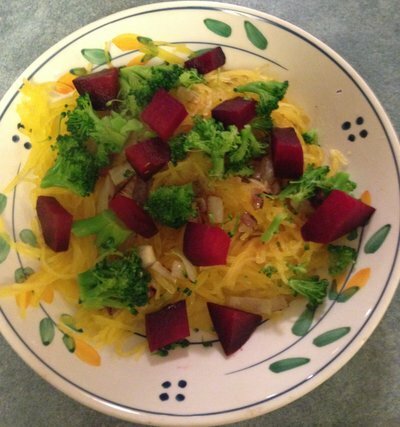 A vegetarian’s delight- spaghetti squash topped with an assortment of vegetables. Pierce squash with a fork in several spots. Place on baking tray and roast for 1 hour. Remove squash from oven and carefully cut in half. (Be careful, it will be hot and steamy.) Leave squash cut-side up to cool. While squash is cooling, bring a medium pot of water to a boil. At the same time, heat a nonstick pan over medium heat. Saute onion, cooking for 10 minutes, until golden. When water comes to a boil, add florets. Boil for 2 minutes. Drain. After 10 minutes, remove seeds from squash. Using a fork, scrape squash so that it separates into strands. Place 1 cup of squash in a serving bowl. Top with half of the broccoli florets and half of the onion. Chop 1 peeled, roasted beet and add to squash. Top with parmesan cheese and olive oil, if desired.